It is easy to gain the impression from TV news channels and Business news pages that the entire global economy has been in free-fall for the last 2-3 years, and that recovery is a long way off. Nothing could be further from the truth. 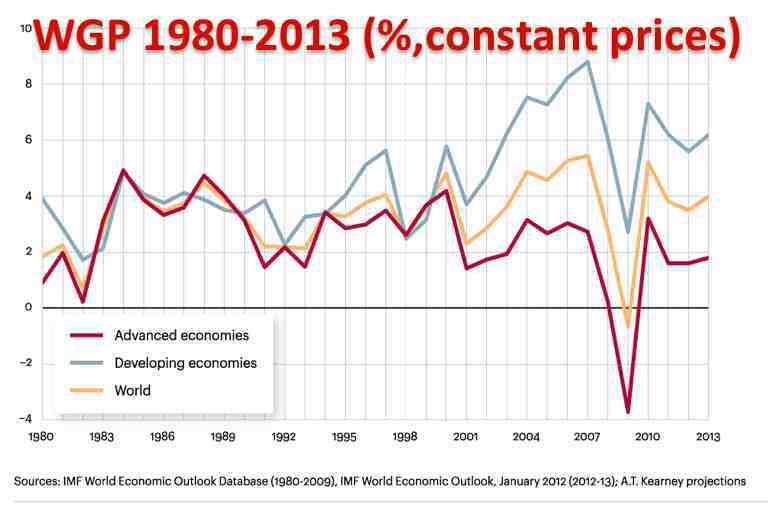 Just look at the graph below – which shows World Gross Product, adjusted for inflation, from 1980 to 2012. Over the 32 year period it is true that we have only seen one dip on the scale of 2009, but look how short it has lasted. By 2011, GWP had bounced back to levels seen in 2004-2007. The world economy only shrank for just over 12 months. Recovery was also swift in developing nations – but remember that on average their lowest growth rate was still around 3%, a level that most developed countries would regard as astonishing in the circumstances. It is true that our world continues to be vulnerable to a further economic shock, but we do need to see these things in the context of longer history, and longer future. What could trigger second global economic crisis? What kind of events could trigger a second global shock? The answer is a wide variety. Here are a few scenarios that, while unlikely, could depress GWP by more than 3% for 2-3 years. 1) Iran – US – Israel conflict: that continues beyond a short missile strike, creating huge fear in the markets of wider contagion, and an oil price spike at over $200 a barrel for more than a year. More likely: limited action, together with severe sanctions, resulting in changes inside Iran. 2) Mutant virus pandemic: similar to Sars or Bird Flu. Remember that with Sars, only 8600 cases and 860 deaths was enough to have a huge impact on international travel and business confidence, especially in all-important rapidly growing Asian nations. More likely: several new mutants emerge over the next two decades, at least one of which is potentially a major global threat, but is successfully contained by increasingly efficient control measures. 3) Messy break-up of Eurozone: Greece leaves earlier than markets expect, followed by frenzied speculation by investors, betting that Spain, Portugal or even Italy could be forced out in the following 2-4 years. The result is unprecedented spike in borrowing costs for governments of these nations, threats of default on debts, actual defaults, and a complex cascade of debt-related crises in many of Europe’s largest banks. More likely: Greece leaves the Euro no sooner than 2014, by which time the risks of it doing so have been fully priced into market risks by investors. Stronger structures are in place by then to limit contagion, and the Eurozone muddles through the following years without meltdown, printing money, tolerating slightly higher inflation as a necessary evil to maintain economic and social stability. But even if there should be second crisis, our world as a whole economic ecosystem is likely to bounce back once more, within 2-3 years. The reason is that the global economic impact of “globalisation” has yet to be fully felt, coupled with the accelerating impact of technology innovation, and the impact of the digital world. – will continue to drive economic growth for the next 30 years, so long as it is not neutralised by increasing trade barriers, protectionism of all kinds. Our world is increasingly trading as a single market. This means that nations with low-income labour are able to sell that labour to higher-income nations, in manufacturing and services which are exported such as software or tourism. This will go on happening until higher income nations have slowed growth of wealth to the point where lower income nations have caught up, (assuming that productivity of workers is also equalising gradually in both parts of the world). Two thirds of the world live in low income nations. One third of the world lives in China and India alone, mostly in very remote places. Over 2 billion more people have yet to join the global economy. Every year, another 50-80 million people move from remote rural areas in the poorest nations, to their nearest cities, providing a continuous supply of very cheap labour. And every year, another 50-80 million city dwellers move up the ladder of education, work experience, skills and income, to become middle class consumers, adding to the growth of internal markets in these nations. Globalisation depends on ever-more efficient supply chains, logistics companies, shipping hubs – all of which will be delivered at speed at even lower cost, despite rising energy prices. – will generate new waves of economic growth, creating industries that do not even exist today. Just look at the last 20 years of advances in the motor industry, in robotic assembly lines, precision engineering, engine design, aerodynamics, computer control. Innovation allows us to do more with less. We have seen similar revolutions in every area of manufacturing. New materials, new processes, even greater economies of scale. New methods of gas extraction for example have increased proven, usable gas reserves from 60 to 200 years in half a decade, despite increasing use of gas. Prices have fallen dramatically in America, shutting 57 less efficient coal-fired power stations. Similar innovation has meant that solar cells, wind power and other alternative energy sources are also falling rapidly in price to a point where they will soon be economically viable without government subsidy. – from old-style web to mobile, our world has been transformed beyond recognition over the last two decades. The poorest nations have in some ways been impacted the most. In nations like Vietnam, there are more mobile phone SIM cards than adults. SMS has revolutionised the ability of remote farmers to judge the precise moment to take their food to market, or the ability of foreign-based workers to send money home to relatives who have no bank accounts. We are still in the first hour of the first day of the first week of the digital revolution. Future generations will record that it took until 2040 for society to fully maximise the economic impact of smartphone technology that was becoming widespread by 2010. So then, it is hardly surprising that the global economy bounced back as rapidly as it did, and barring a global catastrophy, we can expect, on average over the next three decades, at least 2.5 - 3% growth in the global economy, powered mainly by further urbanisation and industrialisation in the poorest nations. We can also expect many future challenges along the way, with booms and busts in industries and entire nations or regions. Such crises will be more frequent because of increasing complexities that connect markets in unexpected ways. Crises will also be more severe because investor behaviour, influenced by hunch, mood and rumour, now spreads around the entire globe in a matter of minutes or seconds. So what are your own views? Please do comment below. Outsourcing is destroying America as it only serves the 1% at the expense of the rest of us.